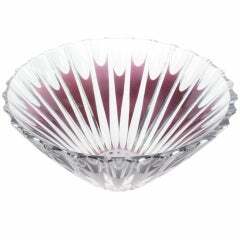 This dynamic and elegant Mid-Century Modern crystal centrepiece bowl was hand blown in France by Art Vannes, circa 1960. Suggesting a stylized "splash", the piece offers a contorting amorphic form full of verve, energy and motion. 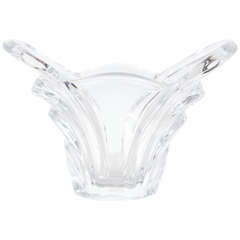 With its clean modernist lines and impeccable quality- executed by one of the most celebrated crystal companies of the 20th century- this piece is as versatile as it is beautiful. It would be a winning addition to any style of interior from traditional to contemporary. 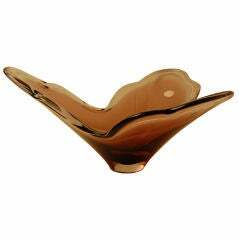 While it is a perfectly functional bowl it is also an objet d'art in its own right, sure to add a touch of elegance to any table or étagère that it graces. The piece has an acid etched signature on the bottom reading "Vannes crystal". Excellent condition. France, circa 1960. 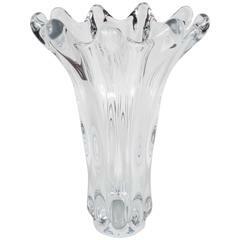 Dimensions: 27" W x 7.25" D x 12" H.
This stunning handblown crystal vase features a stylized floriform design. It also has an acid etched factory mark "Art Vannes", Paris on the underside. It is in excellent condition. 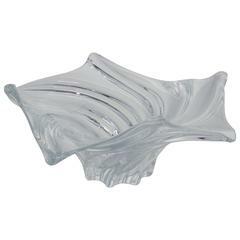 French 1950s crystal bowl in a swirled rib design with six ribbed points. 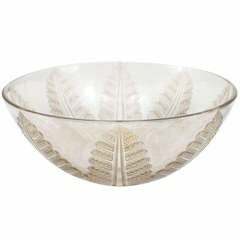 French clear cut crystal bowl with a fern leaf design signed "R. Lalique, France." 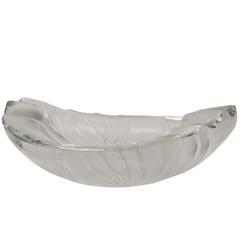 Art Vannes "Le Chantal" glass bowl.